Japanese knotweed is so hated that even some gardeners disinclined to use chemicals use them on it. There are as many methods for killing weeds as there are for delivering a death knell to anything else, but not all methods are equally effective against all weeds. That's why it's important to dig up some dirt on a particular pesky plant before you get into a tussle with it. By studying your foe a bit before engaging it in battle, you gain an edge. The two weeds with which we begin are commonly encountered, yet they're very different from each other. Consequently, you may end up fighting each one differently. One of the essential things to know about the dandelion (Taraxacum officinale) is that this common lawn weed is a perennial; this means that you can't go about getting rid of it in the same way you would for an annual weed, such as crabgrass (Digitaria). You could, theoretically, eradicate crabgrass in spring by using a pre-emergent herbicide, assuming you get the timing correct. That's because, being an annual, crabgrass must start its invasion anew each year (if you fail to eradicate it in spring, you'll have to wait and use post-emergent crabgrass killers on it in summer). But your strategy against dandelions will have to be different. Since they're perennials, they maintain a permanent base camp on your lawn until you remove them entirely. Pulling the top part of the plant inevitably leaves the root behind, only to have the dandelion quickly grow back. Spraying the dandelion with Weed-B-Gon (or any weed killer that is designated for use on a lawn) will kill the leaves but leave the root behind, only to have the plant grow back. Using Weed-n-Feed (or any product that's a combination of weed killer and lawn fertilizer) never gets enough of the weed killer to the tap root, so the dandelion survives. You can kill the dandelions with Roundup (or any other non-selective herbicide, such as vinegar), but this will leave dead spots all over your lawn where the grass around the dandelions is also killed. So the only reasonable solution is a two-step approach that involves first lifting the dandelion off its root with a “weed digger” (that inexpensive fork-like tool) and then spraying a small amount (less than a teaspoon) of Weed-B-Gon into the small hole that you just lifted the dandelion out of, to kill the taproot. That solution does take some work. But if you are determined, it won’t take that long to walk around your yard, bending over to lift out the dandelion, then killing the tap root with the sprayer in your other hand. When you get done, take satisfaction that you figured out how to have the "best lawn in town" while still minimizing the chemicals used to just the small amount needed to kill the root (instead of wasting most of it). This makes it safer for the children and pets who play on your lawn. 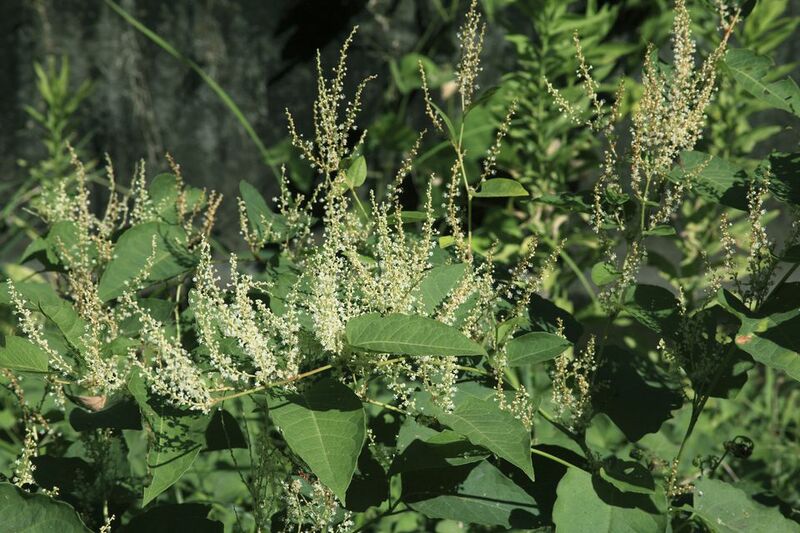 Many homeowners across North America and the U.K. have been forced to share a yard with Japanese knotweed. They have gotten to know it a lot more than they'd like to. It has become so problematic in the U.K. that its very presence on your land reduces your property's value. What's so odd about Japanese knotweed is that, despite it's being so common and so problematic, very few homeowners (even those plagued with it on their land) could identify it for you even if their lives depended on it. This weed lacks name recognition, plain and simple. And that's unfortunate because if you don't know the name of a weed, you can't very well Google it to learn how to fight it properly. You move onto a new property. It is overrun with such problematic plants as poison ivy (Toxicodendron radicans) oriental bittersweet, and bindweed (Calystegia sepium). But the most unsightly area is one on your property border that is covered with Japanese knotweed. So you cut down a swath of it. But then you realize that only the above-ground growth of the Japanese knotweed died; the root ball was barely daunted and sent up new shoots. So you decide to get at the root of the problem, literally, and start digging out the roots. That seems like a great idea until you realize that leaving the least little rhizome behind after your digging will result in the sprouting of more knotweed shoots. No matter how committed you may be, in principle, to green living and weed control without chemicals, it now dawns on you that this is one weed that you may have to spray a glyphosate-based herbicide on to get rid of it. But if you're willing to put in the extra work and remain organic, you can eventually beat Japanese knotweed by smothering it with tarps. One way bittersweet harms the trees it grows up into is by blocking light that would otherswise reach the trees' leaves, light that makes photosynthesis possible. To slow down bittersweet's assault on your trees, simply cut the thickest vines. Just one cut (anywhere from ground level to waist-high, say) will be sufficient. The idea is to keep nutrients from passing from the root system up to the higher parts of the vine. This won't kill the bittersweet (since the roots will still be intact), but it will slow it down and save your trees. If you want to remove some of those roots and thereby slow bittersweet down even further, one trick is to wet the soil first. It's easier to pull roots out of ground that is moist. This is true when it comes to pulling out any kind of weed. Attitudes toward weeds are evolving in some quarters, as people come to appreciate the benefits of biodiversity. For example, far from aiming for moss removal from lawns, some folks are cultivating moss plants (for example, Sphagnum cymbifolium) as an alternative to grass lawns. But if that's not your idea of a lawn and wish to get rid of moss, an important realization for you will be that the presence of moss is an indication of deeper problems. Address those deeper problems first, and moss won't bother your lawn anymore. Similarly, not everyone holds the same view of wild violets growing in the lawn. For some, they're pretty wildflowers to be admired; for others, they're tenacious weeds to be killed. If you're in the killers' camp, spray violets (Viola spp.) in autumn with a triclopyr-based herbicide. Poison ivy is another matter. Few will disagree that a property is better off without it. So the only question regards how you should go about killing it. Proper identification should precede eradication efforts. Once you know for sure what it looks like, you're ready to start getting rid of it. But this is one nemesis with which you can't engage in hand-to-hand combat, due to its toxicity. You must be careful to remove poison ivy safely.